My Easy Apple Pie! Kinda from scratch! Greetings, everyone! If you haven’t noticed, lately I have been deep into baking from scratch due to inspiration from @Kurlfriend! 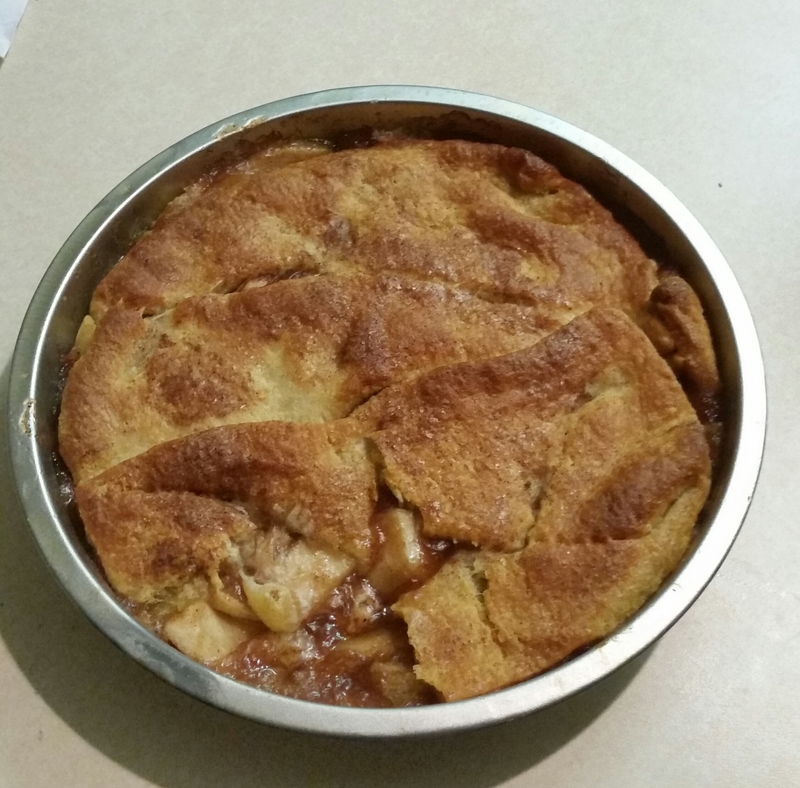 My latest experiment was homemade apple pie! YUM!!! I saw a recipe for a cream cheese apple pie that I wanted to try on pinterest and here is my attempt! I started with the apples because I intended on cheating on the crust part this time around. The main part I was concerned about was properly stewing the apples. 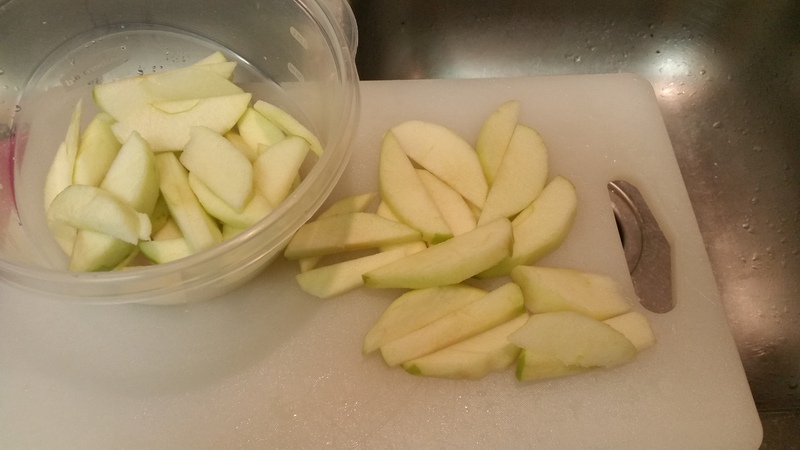 I picked up 4 Granny Smith apples, peeled them and cut them up. All was going good. I was playing my music, singing and doing the Carlton in the kitchen. 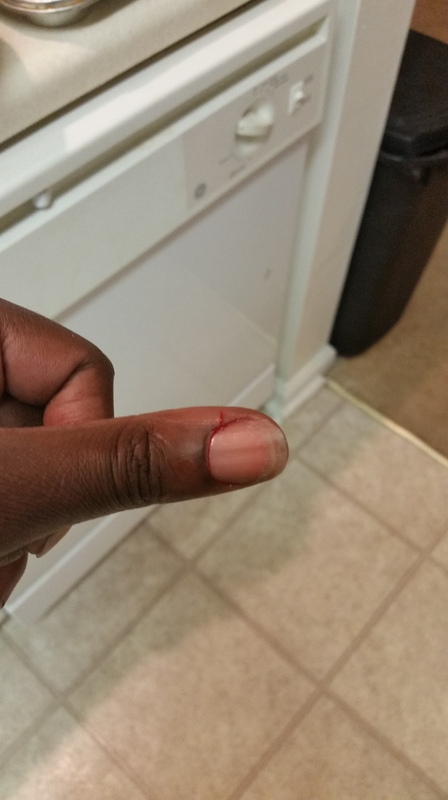 Things were going well until I nearly sliced the tip of my thumb off. By then, I figured it was time to call it a night. I used a few squirts of lemon juice and sprinkled about ½ teaspoon of salt on the apples and filled the plastic bowl with water. The salt water solution keeps the apples from browning! 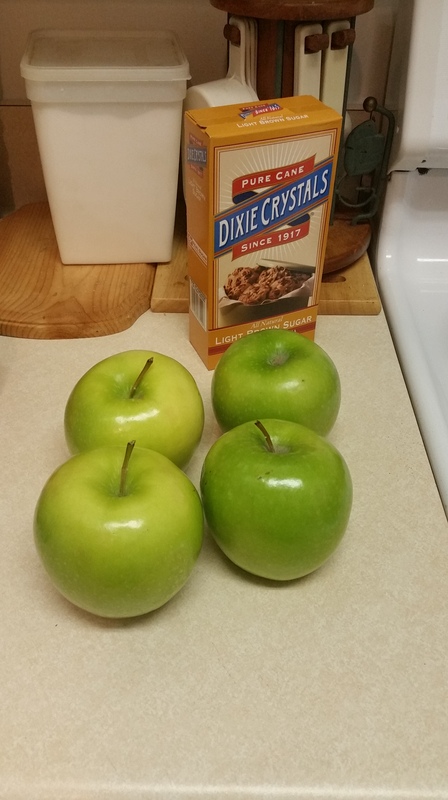 Plus the apples are already perfectly salted for the rest of the recipe! I mixed all of the dry ingredients in the pot and then placed it on the stove burner and slowly stirred in the water. I messed up the first mixture because I just poured the water in on top of the unmixed ingredients while it was on the stove and it was just a big clumpy mess. 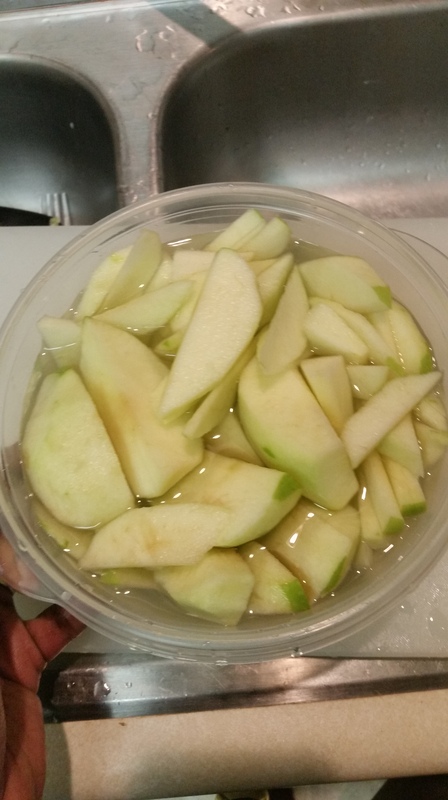 I had to mix frequently when stirring in the water and continued mixing for about 2-4 minutes until the sauce thickened then I poured in the apples. 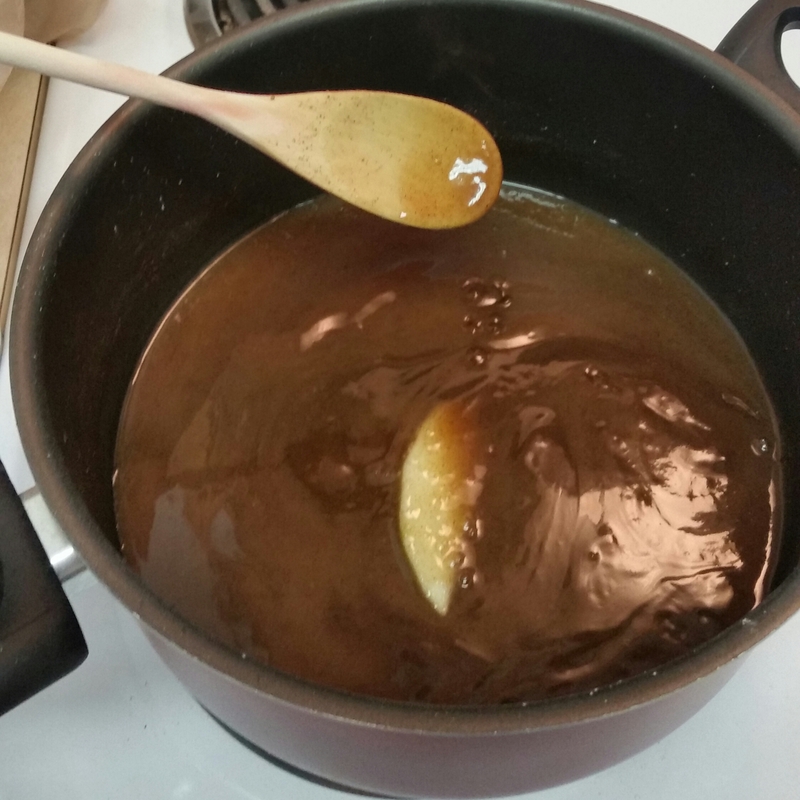 Cinnamon sauce is ready for apples!! 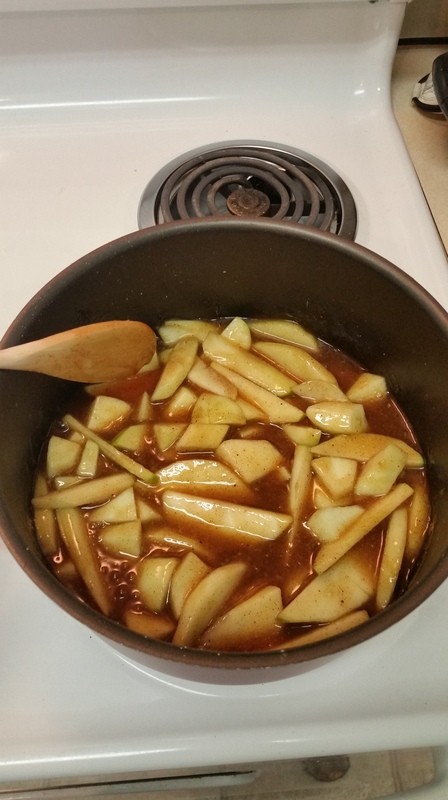 I let the apples simmer on low to medium heat for about 30 minutes until the apples were the texture I wanted. The rest of the recipe is where I cheated. I was ashamed so I didn’t take pictures. Instead of making the crust from scratch, I picked up some Pillsbury croissant dough. I got the buttery kind and laid half (4 triangles) on the bottom of the pie pan and covered that layer with the cream cheese icing. I had some left over from my homemade cupcake experiment the week before. The ingredients were simply cream cheese, butter, a little powdered sugar and a little vanilla. Then, I layered the apple filling I made on top and followed with the other half of the croissant dough. Once that was done, I microwaved 2 tablespoons of butter and drizzled it over the top of the pie and then sprinkled some cinnamon sugar on top! I popped it in the oven at 350° and let it bake for about 40 minutes. I tried letting it bake for the cooking time the croissants required but it wasn’t done yet, I’m assuming due to the pie filling keeping it moist and the butter I poured across the top. This was the finished result and I have to say I was proud of myself! I sent over ½ of the pie and a container of my butter pecan ice cream to my parents to try! I have been out of town so I have to give them a call and find out how they liked it! My whole family are big fans of dessert! Next time I am going to attempt the entire recipe from scratch so I can take 100% of the credit! I hope you enjoyed! If you try this, I would love to hear how it turned out for you! Thanks for stopping in! Author AphropuphsPosted on May 6, 2015 Categories Natural Eating, Naturally BeautifulTags apple desserts, apple pie, apple pie filling, apple pie filling from scratch, apple pie from scratch, apple pie recipe, apple recipe, cinnamon apples, easy apple pie, easy apple pie filling, easy apple pie recipe, homemade apple pie, homemade apple pie filling, homemade stewed apples, stewed apple recipe, stewed applesLeave a comment on My Easy Apple Pie! Kinda from scratch! My Caramel Butter Pecan Ice Cream!!! I started by hand whipping the cream. It took about 20 minutes. My mixer was in the dishwasher so I couldn’t use it. My shoulder was killing me once I was done but I was proud of myself. I whipped it real hard, whip, whipped it real hard! (I couldn’t resist) I mixed until there was more cream sticking to the whisk than the bowl. 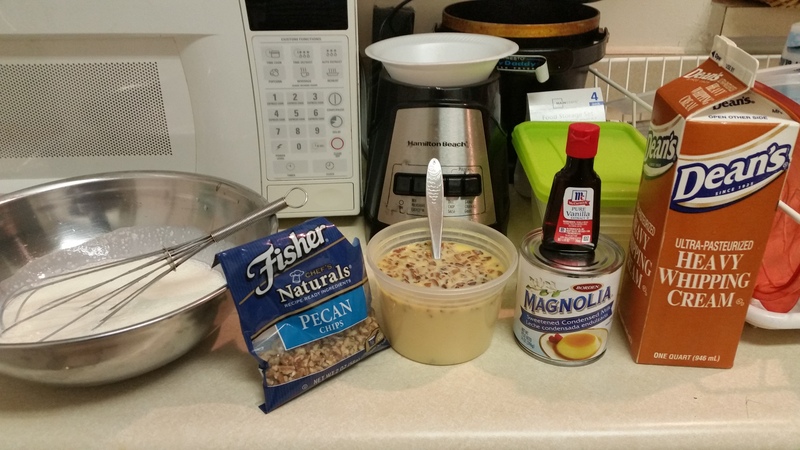 I had already mixed the condensed milk with the butter, vanilla extract and pecans earlier so they would be ready to mix in once I got this cream whipped. I mixed it in well with the whisk and it was a thick cake-batter consistency. 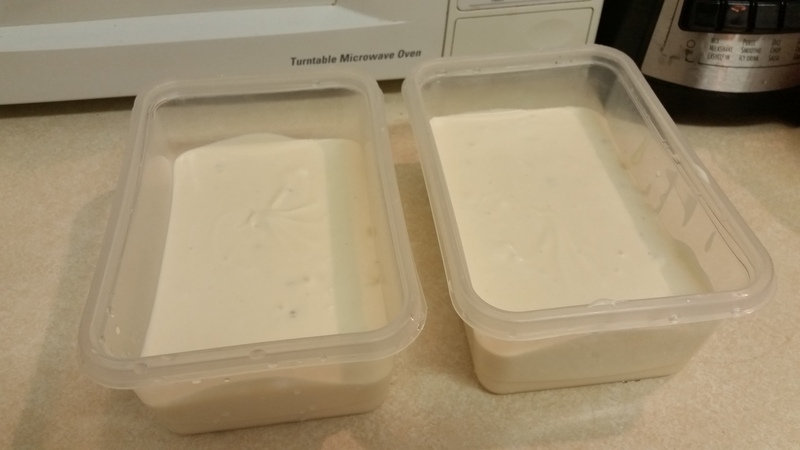 I placed the mix into two plastic containers to freeze for about 6 hours. Once they froze for about an hour or 2, I took them out and added my caramel drizzle. I wanted something that would thicken in the freezer so I opted for a caramel sundae topping instead of the caramel flavor sauce. I drew zigzags across the top and dragged my toothpick across for some pretty ribboning and placed back into the freezer overnight. My parents love butter pecan ice cream so I set aside some for them. I hope they like it! I am going to get it to them tonight. 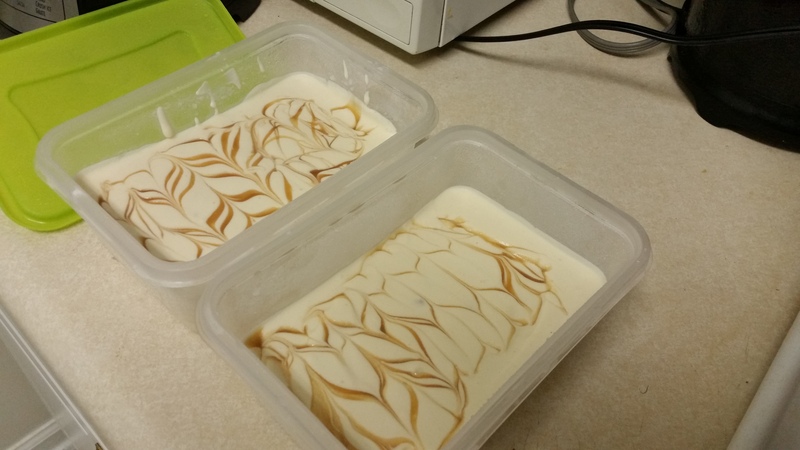 These are the finished results of my caramel butter pecan ice cream. Also, unlike its predecessor mango soft serve, it passed the taste test. It tasted just like butter pecan that my parents usually buy, maybe even better. Caramel Butter Pecan Ice Cream. Do you see those ribboning skills?! I might as well go ahead and confess. 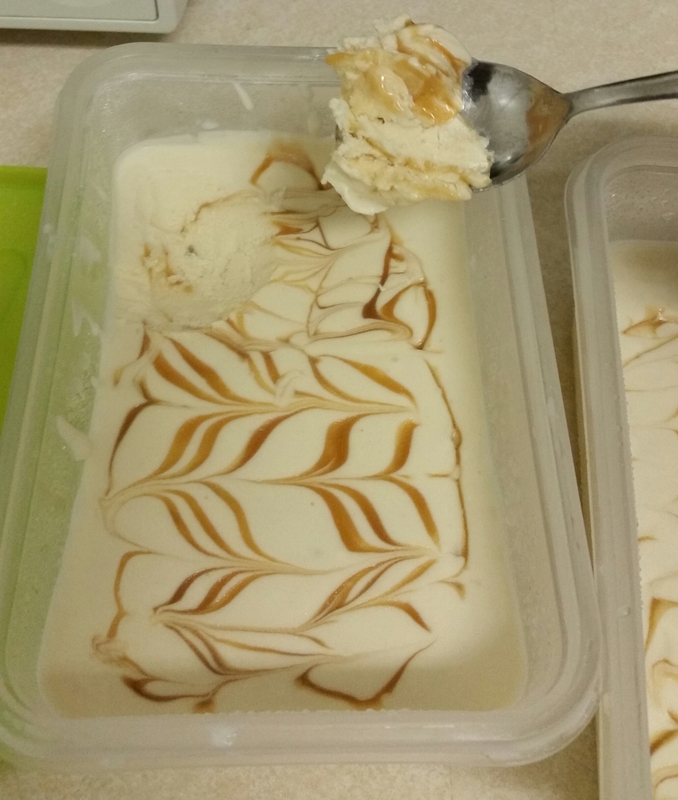 This ice cream was made as a topping to go with a ginger apple pie I was working on as well! I will be posting the results of that later! If you haven’t realized by now, I have a sweet tooth! Of course, this summer I am going to be trying all types of ice cream recipes! vanilla, caramel, cookies and cream, mint chocolate chip, rocky road, cherry vanilla, strawberry! I can’t wait and I will be sharing them all! I would love to hear some of your ice cream recipes! Author AphropuphsPosted on April 29, 2015 April 29, 2015 Categories Natural Eating, Naturally BeautifulTags butter pecan ice cream, condensed milk ice cream, cooking, easy ice cream recipes, food, homemade ice cream, ice cream, ice cream recipes, simple ice cream recipes, simple ingredient ice cream, simple ingreedient ice cream12 Comments on My Caramel Butter Pecan Ice Cream!!! Hey, now! I came across a mango soft serve ice cream recipe a couple of weeks ago and finally decided to try it. The photos I saw online and on pinterest looked so tasty so I had to give it a try! I started off with 3 basic ingredients. However, I have seen alternate recipes for this. Some require only to puree the frozen mango. Some include frozen mango and banana, another is just the frozen mango, with heavy cream and a few optional drops of sweetener. Some even use plain or frozen yogurt in place of the heavy cream. I felt the lemon juice would add a little zest to the flavor but I was so wrong. The outcome had a chalky mango taste that I did not like too much! If you look at the picture you can see 2 different textures of mango. 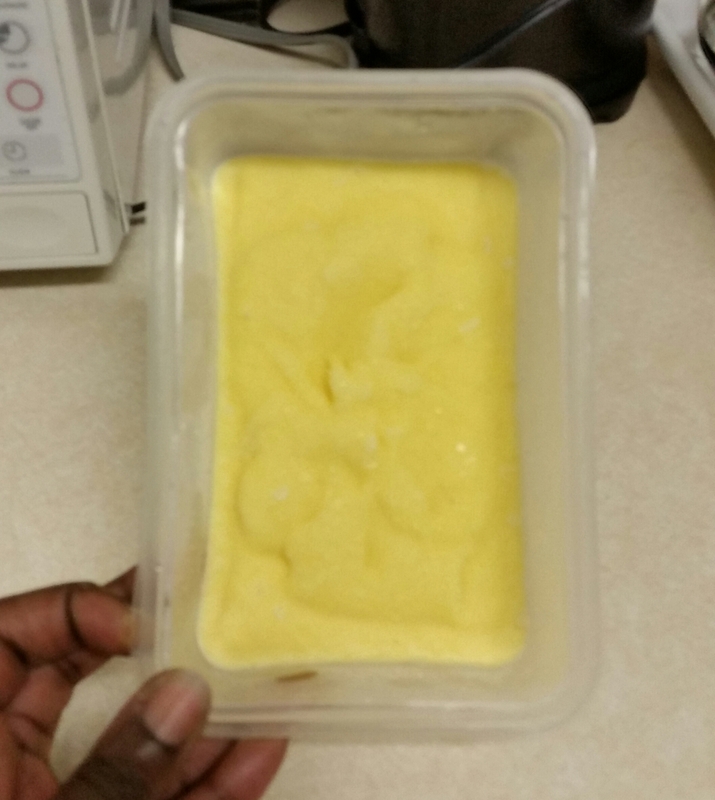 One was an actual mango that I froze and the cubes are Dole frozen mango cubes that I purchased. Starting off, a put some drops of lemon juice on the mangos and pureed them my blender until it was a nice creamy texture and then I added a little bit of heavy whipping cream at a time until it reached a consistency I liked. I did not use more that 1/4 cup of heavy cream. 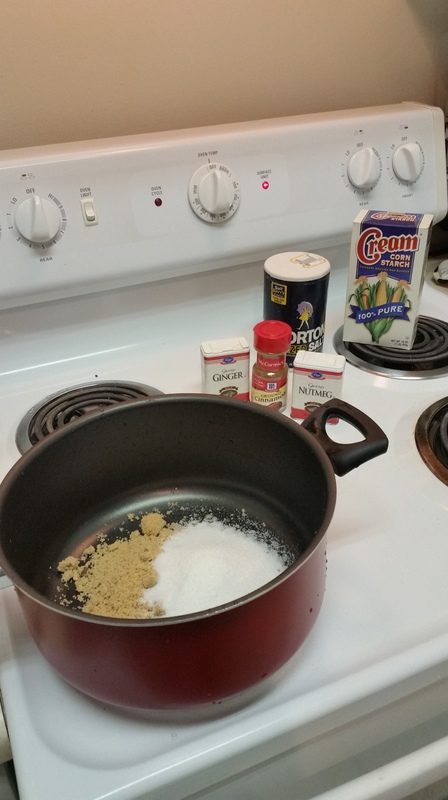 Once I experienced the bland chalky flavor, I added a teaspoon of sugar. It helped a little but not much. I’m not sure where things went wrong. Was it the frozen mango? Was it the one I picked at the store? I am not experienced in selecting mangos so that could have been the start of my problems. I went by the info I found online. When I gripped the mango in the store it had a mushy texture. I froze my blend and in about an hour it was set. Too bad it wasn’t very yummy to me! This recipe could work with a variety of fruits! I would love to hear what your created! Boil black-eyed peas with chopped onion and light seasoning until tender (30-45 mins) . Once tender, you can add the mackerel. I like to remove the filets from the can and remove the soft bone and some of the skin from the fish and then mashing it a bit with my hands before adding to the stew. I also like to pour a little of the juice (about 1 or 2 shots depending on the amount I’m cooking) from the can into the peas for a little flavor. Stir everything together and season to your taste. Let’s simmer on low for about 15 minutes stirring frequently. While the stew is simmering, you can start boiling your rice and frying your plantains! Boil rice until they reach your desired texture and fry plantains on medium high heat in a cooking for about 6-8 minutes both sides until lightly browned. Cooking time may vary depending on thickness of plantain slices! 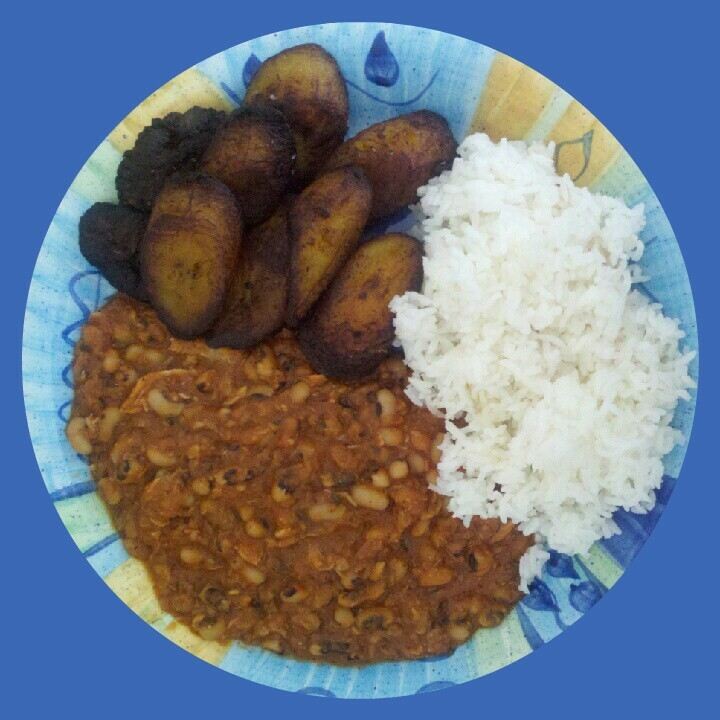 This meal is healthy because you get protein, various minerals, beta-carotene, omega fatty acids from the stew. You get potassium, and vitamins A,C, and B-6 from the plantains and jasmine rice is a decent source of carbs and niacin! Plus, I love how it smells when it is cooking! Brown rice is always a healthier and highly recommended alternative! There are many other things I would like try when it comes to this recipe. I want to try different kinds of beans and rice. I have been playing with the idea of making rice balls and plantain balls. 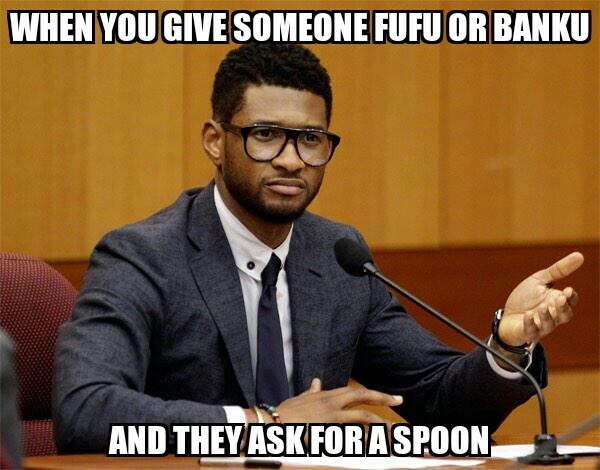 Rice and plantain mashed together into balls would be great too!